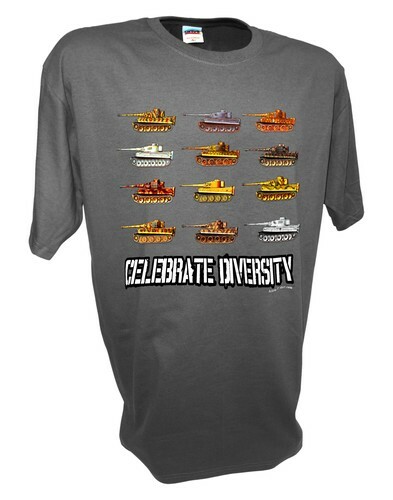 Look at all the different Tiger 1 tanks...gotta love that diversity. The German heavy tank used in World War II was the PzKpfw VI. The first official German designation was Panzerkampfwagen VI Ausfhrung H however the tank was re-designated as Panzerkampfwagen VI Ausf. E in March 1943. The panzer also had the ordnance inventory designation SdKfz 181. The Tiger tank was to be fielded by the Germans from late 1942 and all the way up until the collapse in 1945. It was given its “Tiger” nickname by Ferdinand Porsche (the Roman numeral was added after the Tiger II was manufactured). The design served as the basis for other armored vehicles, the Sturmtiger heavy self-propelled gun and the Bergetiger armored recovery vehicle. Tigers were capable of killing the American M4 Sherman tank or British Churchill tank IV at ranges exceeding 2,000 m. In contrast, the Soviet T-34 utilizing with the 76.2 mm gun could not penetrate the Panzerkampfwagen VI frontally at any range, but could attain a side penetration at just about 500 m firing the BR-350P APCR ammo. The T34-85 tank 85 mm gun could penetrate the Tiger from the side at about range 1,000 m. The IS-2’s 122 mm gun could destroy the PzKpfw VI at ranges beyond 1,000 m. From a 30 degree angle of attack the M4 Sherman tank’s 75 mm gun could not penetrate the Tiger tank frontally at any range, and needed to be within 100 m to achieve a side penetration against the 80mm upper hull superstructure. The British 17-pounder as used on the Sherman Firefly, firing its normal APCBC ammunition, could penetrate frontally out to over 1,000 m. The US 76 mm gun, if firing the APCBC M62 ammunition, could penetrate the Tiger frontally out to just over 500 m, and could be at ranges in excess of 1,000 m to achieve penetration against the upper hull superstructure. Using HVAP ammunition, which was in constant sparse supply and primarily issued to tank destroyers, frontal penetrations were possible out to just over 1,500 m. It is worth mentioning that many of the penetration capabilities at longer ranges had little relevance compared to combat engagements of the real war, especially that which was fought in Western Europe, where battles seldom happened outside of one kilometer due to scattering and chance for human mistake, which is amplified greatly as range increases regardless of the ability of any cannon. For example, while a 17pdr could penetrate the front armor of a Tiger 1 at one kilometer in tests, during actual combat, a 17pdr gunner would probably never find himself in a position to actually attempt such a feat. As range gets smaller in combat, all guns can penetrate additional armor (with the exception of HEAT ammunition, which was rare in World War 2). The great penetrating power of the Tiger tank’s 88mm gun meant that it could destroy many of its opponents at ranges at which they could not respond. In open terrain, this was a major tactical advantage. Opposing tanks were often forced to make a flanking attack in order to knock out a Tiger. The Tiger 1 was first used in action in September 1942 near Leningrad. Under pressure from Hitler, the panzer was put into action months earlier than planned and many early models proved to be mechanically fragile. In its first action on 23 September 1942, many of the first Tiger tanks broke down. Others were taken out by dug-in Russian anti-tank guns. One panzer was captured largely intact, which gave the Red Army a chance to study the tank and prepare a response. In the Tiger tank’s beginning actions in North Africa, the panzer was able to master Allied tanks in the open terrain. Notwithstanding, mechanical failures meant that there were rarely more than a few in action. In a replay of the Leningrad experience, at least one Tiger 1 was knocked out by towed British six-pounder antitank guns. The panzer’s extreme weight limited the bridges it could cross and made drive-throughs of buildings, which may have had basements, hazardous. Another weakness was the slow traverse of the hydraulically-operated turret. The turret could as well be passed over manually, but this choice was seldom used.